It’s safe to say that on our beef farm we eat a whole lot of chicken…just kidding! We eat a lot of beef. It’s pretty much always on hand at our house. On our farm we typically take a steer or heifer (boy or girl) in for harvesting whenever our family is low on meat. And since we are taking one animal and splitting it between three very growing families it’s safe to say that is pretty often. When I first married my husband we used to get pretty much the same cuts of meat. And we still do, but I always request a few more that have quickly became my favorite cuts of meat. I think it’s a given if you are a beef eater that everyone loves a good steak. And when it comes to steak it all comes down to a few things. Where the meat comes from on the animal and how it’s cooked. Steaks need to be cooked fast and typically dry. Meaning they don’t need any moisture to help them stay tender and juicy. Well, as long as you don’t cook it like crazy and cook out all that tender juiciness. Please, please no steak turned into a glorified hamburger. Steaks are cut from some pretty strong muscles of beef, but not quite the strongest. And that’s why they don’t need to be cooked for a long amount of time to make them more tender. I love the power of google. And when I was teaching in the classroom I used the below image very often. It’s perfect for showing you what I need to say. If you take a look near the rump area you will see Sirloin, Tenderloin, and Top Sirloin. 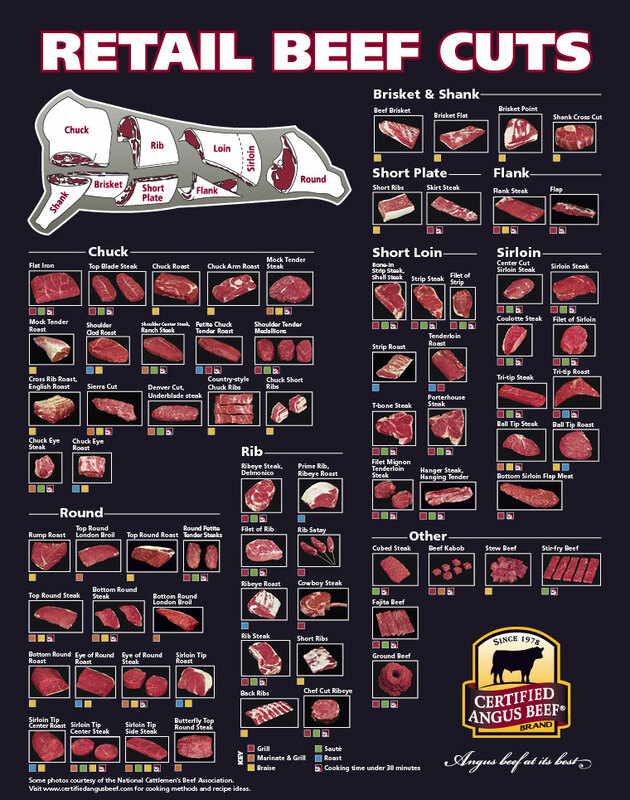 These are some of the most tender cuts of meat you can get from a beef. The much love filet mignon is cut from the tip of the tenderloin, which is why it’s so tiny. There isn’t a whole lot there to take. This area is the most tender because it’s away from some of the hardest worked parts of the body. Such as the legs, thighs, shoulders, chest, and back end. Now, most of the time if you have a freezer full of beef always at your fingertips I can guess that the steaks will get plowed through right away. However, for us, what we use up first are actually the tougher, bigger hunks of meat. The roasts. Who doesn’t love a good pot roast on Sunday after church? They are my favorite. Roasts need to be cooked slow and moist to really achieve a good tenderness that you will enjoy. Which is why they are perfect for busy families, throw them in the crock pot with some other ingredients and you are good to go for supper when you get home from work or school. Once I found a couple of really yummy recipes I quickly found a favorite roast meat. About every other time I convince my brother in law to order me a brisket. In reference to the picture above you will see that it’s right at the chest and between both front legs. This is a really, really tough cut of meat. And if not cooked right, it will taste super cruddy. But, I have found some of the perfect recipes. And yes, you can cook it just like a roast you might throw in the crock pot, slow over the course of a day. But, take my advice and try this chunk of meat in a different way. The most recent way we have discovered, that we now love, is breading slices of brisket and then deep frying them for about two minutes. Talk about so, so tasty. 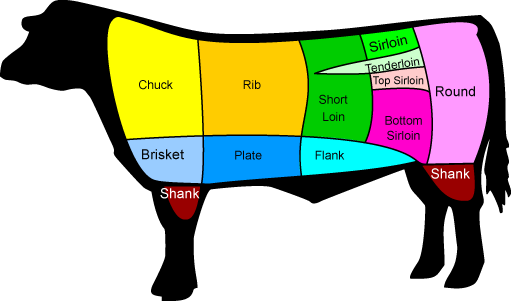 Depending on where you live brisket may be a more common piece of meat, or it might be a special order at your meat counter. I actually keep this exact photo handy in my recipe binder at all times. If you click on it, it should open for you and you can print it. Or, google it if you want to see a bigger version. These charts are super handy, and for the most part you can find one for all of your species, such as poultry or pork and even lamb. They are really handy and even though I am pretty knowledgeable in my beef meat cuts, I still find is useful! Just remember that no matter what cut of meat you are cooking it’s super important to use a meat thermometer to check for doneness. The day I picked up my meat thermometer was the day that I really perfected cooking beef. I still have slip ups, and sometimes I do get lazy and just go with what I think is about right for color and doneness. But, those are always the days that the meat either gets overcooked or undercooked and I feel like I ruined a meal! Because it’s so much better when cooked just to the right degree of doneness. 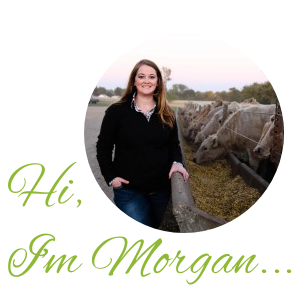 Do you have an absolute favorite beef cut and the perfect recipe to go with it? Please share! I love new recipes and I love trying out new cuts of beef! Happy Cooking!